The much-hyped shipment of crude oil from Nigeria has taken an interesting twist, with the latest report indicating that the ship dispatched for the oil supply has been chased away by the Nigerian Navy. MV Africa, the vessel chartered by the Tema Oil Refinery (TOR) to go and lift the first consignment of 80,000 metric tonnes of the black gold to feed the refinery was chased away by Nigerian Navy patrol vessels citing illegality, DAILY GUIDE has learnt. 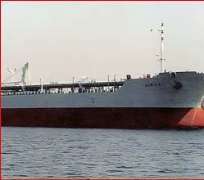 Owners of the ship, a company named, Targos, dreaded having their vessel hovering on Nigerian territorial waters because of prowling pirates and were too elated to have it back in Accra albeit with no crude oil cargo. The arrival of crude oil to feed the vegetating TOR is almost a cliché, with cynics poking all manner of fun about it. This latest bad news is coming on the heels of reports of a possible increase of pump price of petroleum products, making nonsense of the government promise to reduce petroleum prices drastically. The National Petroleum Authority (NPA) acting Chief Executive, Alex Kofi Mould, is said to be hovering around the Korean Peninsula in Asia in search of cheaper oil to avoid the imminent hikes. At the time the government-authorized announcement of the expected October 7, 2009 arrival date of the first consignment of crude oil was made, an arrangement was said to have been concluded with a company called Smok, for the lifting of 80,000 metric tonnes from Nigeria to the country. The country waited and waited, but the consignment never came, with the media, especially radio stations, tasking the management of TOR to be specific with dates. TOR Chief Executive Officer (CEO) Dr. Kwame Ampofo told Oman Fm that unlike the airline industry, the arrival dates of ships are difficult to predict, but assured all that the consignment was en route to Ghana. He attracted the ire of some Ghanaians when he insulted those he called cynics because “they were rejoicing over the crude oil situation”. He was recorded as saying that “those rejoicing over the situation are evil-minded”. The Nigerian envoy in Ghana, during his country's 49th independence anniversary at his residence on 1st October 2009, jumped into the fray of the crude oil matter when he assured Ghanaians that arrangements had been concluded for its arrival. But two weeks after the announcement, crude oil is nowhere to be found, compounding the precarious oil stock in the country which has reached an alarming stage. There are pockets of fuel shortages across the country, especially in the northern parts. Dr Ampofo expressed dismay at media reports which sought to cast doubts about the arrival of the commodity when he stated that arrangements had been concluded for regular delivery to Ghana to buttress the historic bond of friendship between the two countries. With the chasing away of the TOR-arranged vessel and the fact that no crude oil is en route to Ghana, it has become clear that the CEO's disclosure lacked credence. Another consignment of 100,000 barrels of crude oil was scheduled to arrive at the refinery on 10th October 2009, but that too did not materialize. This was the Scanoil connection, arranged to circumvent the Mills government's much despised Nigerian-favoured Sahara oil. There is no doubt that the crude oil arrival from Nigeria has become a jinx, a worrying albatross around the neck of the government. The closest the country came to acquiring crude oil to re-start the now idle refinery, Ghana's most sophisticated gadget, was when 500,000 barrels of the commodity arrived but returned over improper payment arrangements. The “Okpokiti Oil” as it was dubbed, was carried by MV Delta Captain which hovered around Tema bay this year with its cargo for some days, but failing to have it discharged, returned to its port of origin, DAILY GUIDE learnt. A payment arrangement, possibly with the Bank of Ghana or some other germane government agency, caused the hogwash and the eventual non-delivery. The NDC manifesto pledge to stop dealing with Sahara Oil in respect of lifting the commodity from Africa's largest oil producer has not gone down well with industry players in Nigeria. The cartel, which has the trappings of a mafia, is said to be behind some of the challenges the government is suffering in this regard, especially with TOR's inability to raise Letters of Credit (LCs) from local banks because of over exposure. President Mills has not relented in his efforts for alternative arrangements, the better economic sense in dealing with Nigeria because of proximity notwithstanding. His recent visit to leftist Venezuela in search of such an alternative was anything but successful, with no concrete pledge of a single barrel being made by the South American strongman. He had earlier knocked on the doors of the Libyan strongman also to no avail, even after a number of overtures such as fully partaking in that country's 40th anniversary of President Muammar Gaddhafi's successful coup which ousted King Idris. Ghanaian soldiers were airlifted to take part in the colourful parade in Tripoli. The Nigerian option remains unrivalled in terms of cost-effectiveness, but with the glaring challenges, government might have to return to the drawing board for new approaches. As for the Ghanaian motorists, they would have to braze up for an imminent price hike of the commodity, a development being influenced by the increase in the price of crude oil-$78.67- on the world market. The World Bank conditionality for the country's second tranche of $150 million is the removal of subsidies on petroleum products- an installment due to be released sometime this month.